The easy way to get lawn mowing and more from the top lawn pros in Oklahoma City. With all of the rain boy did the grass grow and William took great care of it and it looks amazing again! Travis was very maticulous and did an amazing job on mowing and edging and cleaning up. Definitely recommend their service. Teresa always does a great job on my lawn. I'm very happy with my service and glad I selected LawnStarter company to help me with my lawn. We currently have no rainfall data available for Oklahoma City, OK. The capital of Oklahoma, Oklahoma City is a vibrant town known for its cowboy culture and working oil wells. The city is packed to the brim with different things to see, do, and explore, and is a great place to both live and work. As the capitol, this city is home to dozens of historical sites and venues. The National Cowboy and Western Heritage Museum is one of the largest, showcasing both pioneer and Native American art, among other cowboy memorabilia. The Oklahoma City Museum of Art is another must-visit spot, featuring works by local glass artist Dale Chihuly. Bricktown, in the southern part of the city, is home to a revitalized warehouse district with dozens of shops, art galleries, breweries, and restaurants. This area also features Chickasaw Bricktown Ballpark, where you should catch a game from the hometown Oklahoma City Dodgers. The nearby Civic Center Music Hall is a fantastic spot to catch a show or concert at any time of the year, while Stockyards City, just across the Oklahoma River, operates one of the world’s largest and most thrilling cattle markets. If you’re a nature or wildlife enthusiast, be sure to pay a visit to the Oklahoma City Zoo and Botanical Garden. This zoo features a wide variety of animals, along with shows, walking trails, and other attractions. The Myriad Botanical Gardens are another must-visit spot, offering over seventeen acres of formal gardens, dog parks, and conservatories. Unfortunately, you can’t enjoy any of these attractions if you are constantly worried about your lawn care tasks. Consider hiring LawnStarter for all of your lawn care needs. We are the top lawn care provider in Oklahoma, and can tackle even the most complicated landscaping task. Whether you’re looking to have your lawn mowed or your trees trimmed, LawnStarter is the best place for you to turn for any lawn care need. All you need to do is install the convenient LawnStarter mobile app, compatible with both Android and Apple devices. This app will allow you to schedule, modify, or cancel services, all from the comfort of your own home. Once you’ve entered your specific zip code, we will provide you with a list of customized services, including a range of prices and start dates to suit any budget or schedule. You pick the items that work best for you and your home – no one-size-fits-all approach here. If you’re tired of being dealt a standard price when scheduling your lawn care services, turn to us. We will work with you to design a lawn care services plan that meets all of your needs, at an affordable price. We believe that lawn care is about maximizing your free time, while at the same time beautifying your lawn to become the landscape of your dreams. If this sounds like something you’ve always wanted, contact LawnStarter today, and spend more time exploring all that Oklahoma City has to offer. Shelby Link is the owner-operator of Razor Sharp Mowing And Edging, a reputable lawn care service provider in Oklahoma City. Shelby has earned a 4.6 / 5 rating. Looking for a lawn care service provider that's attentive to detail and dependable? Look no further. Tez Scapes is a family owned and operated lawn care company based on OKC. We always strive for client satisfaction. The smile on a client's face when we turn an overgrown jungle into a well kept lawn they can be proud of, well, it's priceless. I hope we can work together. Hi I'm Jenna, owner of Lawn and Hardscape Care. We can help maintain the entire yard, driveway, deck, patio, sidewalk, ect. Whether you need lawn mowing or your sidewalk pressure washed, we can get the job done to your utmost satisfaction. Look forward to meeting you! Thank you Ignacio! The lawn looks great! I definitely appreciate Eric fitting me in today! I have taken care of my lawn needs on my own and know it can be a bit to handle. He was quick and efficient! Hopefully he will continue to mow my property in the future! Muhammad did SUCH a good job. My husband and I were both very impressed and still raving about his service. He was respectful and made sure we were happy with the way our yard looked before he left. We are looking forward to the next service by him. The yard looks very clean and he took his time paying attention to detail! Thank you! In General Lawn Care Services. Thank you so very much for all of your help!!! We look forward to working with you!! Yard looks great! I had asked if the grass near the rocks could be cut down, but I understand it's been a minute since I asked and when Kevin was able to come (due to weather) thank you so much! Missed the grass area above our stone wall in the back yard. Grass cut unevenly. I think we need that shorter blade again. Looks awesome. Thank you. Were you able to give an estimate on bush trimming for front? Thanks SO much!!! GREAT job!! Thank you Paul, our lawn looks great! LawnStarter pros will let you know what your lawn needs. 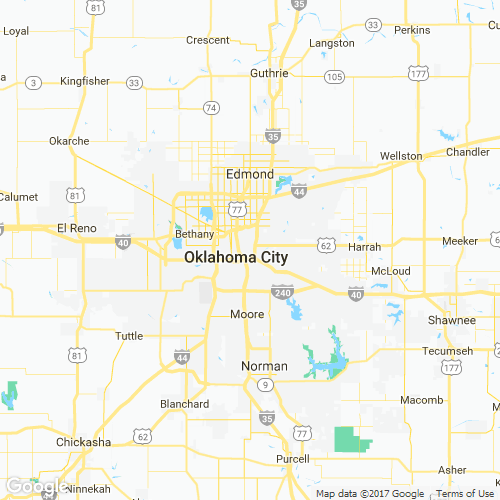 Here are some recent recommendations for extra lawn services in Oklahoma City, OK. Description: Front yard Round off the three in front yard bushes. Cut off dead ends. Description: Full yard Thus is a fertilizer application quite for the entire yard. Description: Front-yard Bushes need trimmed, and leaves picked up. Items Needing Service: I need the ivy removed from touching the garage. In addition, I need the trees next to the garage trimmed. Please see pictures. Location on Property: Near the garage, please see pics. Work to be Done: Please see my previous statements. Serviced by: Lucas Murrell's Landscaping Inc. Items Needing Service: Bushes along front and side of house need to be trimmed. Items Needing Service: Can the leaf removal be done in the back yard? Serviced by: Mow And Grow LLC. Items Needing Service: Rhododendrons need to be cut back. Bushes need to be trimmed. Location on Property: Rhododendrons are in front of house. Bushes along side and around back fence. Work to be Done: Like them to all be trimmed/cut back and cleaned up after with disposal of trimmings. Are there watering restrictions in Oklahoma City, OK? Does Oklahoma City, OK have long / overgrown grass ordinances? We have no records of city or county-mandated long grass ordinances in Oklahoma City, OK. However, 28% of customers in Oklahoma City report having overgrown grass restrictions mandated by their Homeowners association. "What is one way you can make your lawn / garden more eco friendly?" One way to make your lawn / garden more eco-friendly is to use what we call, the 'buddy system'. Some plants work well together, and some plants don’t. Just like people. Companion planting is putting plants together that have a healthy kind of co-dependency—in providing nutrients, warding off disease, repelling pests and attracting the good bugs. For example, carnations keep slugs away from roses and lavender. Roses and lupin make a great team; they get bigger and stronger together. Marigolds must be the Florence Nightingale of the plant world—they help nearly all other plants. Before planting, you have to do the necessary research to take full advantage of companion planting (in lieu of a Match.com app for plants). You don’t want to have “nightmare neighbors” in your garden. Hello, Oklahomans. Expect nothing less than sheer professionalism from ASA Quality. Choose us to keep a smile on your face every time you pull into your driveway! Due to the rain, the grass had gotten really long and we were concerned that it may not look great when mowed. However, the team did a great job and the yard looks wonderful. Thanks so much!